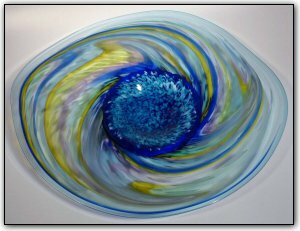 This *very large* incalmo wallbowl is made from several separate sections and features lovely shades of blues in the center, with blue, pink, purple, and yellow swirling around. Incalmo is an extremely complex technique where each section is made separately and then they are joined one at a time while the glass is still hot. And measuring over 2 feet across, this is a really large wallbowl!